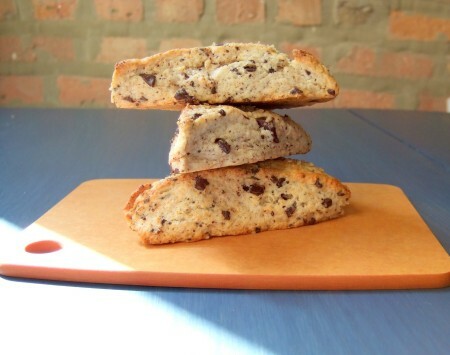 Sometime early in our relationship, when we had been dating for perhaps several months, Dan and I started making scones. It was an almost weekly occurrence, a satisfying project that could be completed in under an hour, proof that we had done something productive in the course of an otherwise relentlessly lazy weekend. I no longer remember how we settled into scones. I imagine it had something to do with their sturdy, homey appeal, which makes them so comforting to nibble on combined with their faint air of Britishness (even if a scone in Britain is something closer what Americans call a biscuit), which lends them a certain cosmopolitan stature and makes them seem somehow less pedestrian than a muffin. Or maybe it was just their undeniable deliciousness. We tried different recipes, added blueberries or raspberries or cinnamon chips, played with amounts of butter and fat content of milk and ratios of whole wheat pastry to all purpose flour. We ate our share of scones. My sister and our roommate even joked that Dan and I should open a bakery selling scones (and pizza, our other staple at the time). After a while, for no particular reason, we drifted out of making them. 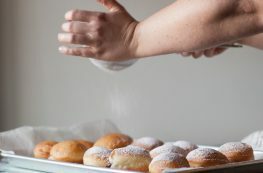 We branched out into other baked goods and found ourselves with busier weekends when we sometimes baked nothing at all. But we recently revisited the habit with a new recipe and were reminded why scones were so easy to fall for in the first place. 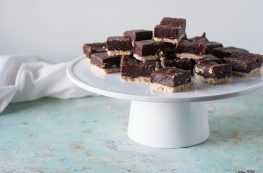 This recipe is another one from Alice Medrich’s Bittersweet. Made with cream and no butter, these scones are rich, yet light, and crumble when bitten into. The dough is noticeably less sticky than other scone doughs I’ve worked with, and it comes together easily. Out of the oven, these scones are golden on the edges but otherwise a delicate pale speckled with dark bits of chocolate. I think they’re even better on the second day, when their lightness gives way to a pleasing density. I think I could get used to having scones around again. These scones are quite delicate and not too sweet. Any type of chocolate works here, and chocolate chips would be fine, but I prefer the texture of uneven bits of melting bittersweet. These are probably too delicate to stand up to any fresh or frozen fruit, but I have a hunch that dried fruits, such as currants, tart cherries, or apricot pieces would be lovely in lieu of chocolate. Cinnamon chips or other flavored chips could also work, if you aren’t in the mood for chocolate. With more than a cup of cream, they are not exactly health food, but they’re worth the splurge for a treat. A coarse sugar, such as turbinado or demerara will be prettier on the tops, but any mildly flavored sugar, including plain refined white table sugar, will do. You can replace a half cup of the all-purpose flour with whole wheat pastry flour, white whole wheat flour or regular whole wheat flour for a slightly heartier, but still tender and light, scone. In a large bowl, mix flour, sugar, baking powder and salt until well combined. Stir in chocolate chunks. Add the cream and mix until the dry ingredients are moistened. The dough will seem a little dry, but should hold together when pinched. With your hand, knead the dough in the bowl, gently, until it all comes together in a smooth ball. 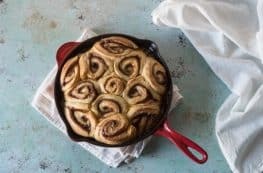 Turn the dough out onto a clean counter (or silpat or sheet of parchment paper) and pat into a circle about 8 or 9 inches in diameter and about 3/4 of an inch thick. With a butter knife or bench scraper, cut the dough into 8 wedges. Place the wedges onto the prepared baking sheet. Brush the tops with milk or cream and sprinkle with turbinado (or other) sugar, if using. Bake for 12-15 minutes, or until the edges and tops have turned golden. Cool on racks.